The Creighton men's basketball team hosts Butler on Friday in the annual Pink Out game. OMAHA, Neb. 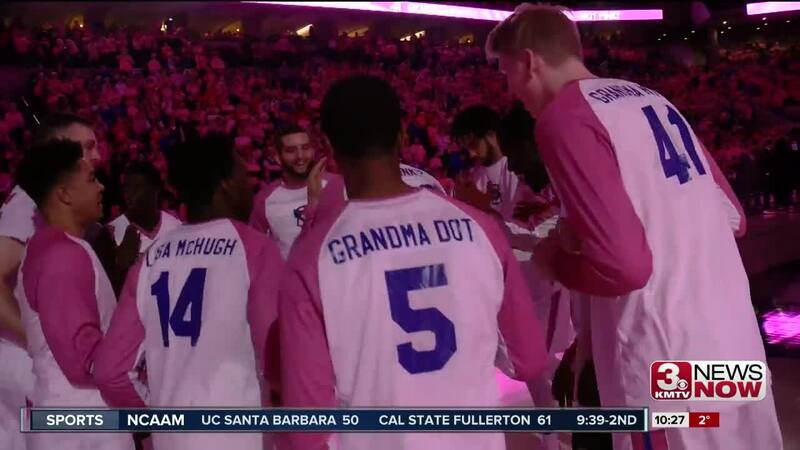 (KMTV) — The Creighton men's basketball team hosts Butler on Friday night in the annual Pink Out game. The Jays will wear pink warmups & jerseys that have been auctioned off with the proceeds going to the fight against cancer. CU has already raised over $200,000 in the eight year history of the event. "Raising over a couple hundred thousand dollars is great," said head coach Greg McDermott. "But it's the email I get from a young lady that went and got a mammogram because of the message of the Pink Out and they found a small lump. They were able to get it taken care of before it became anything major. That's really what this is all about." The first 16,000 fans will receive a free pink t-shirt. Tip time from the CHI Health Center is set for 7:30 p.m. on Friday.